There have been concerns raised about whether the new 5G wireless network that’s being rolled out could be weaponized into an Active Denial System (ADS) nonlethal weapon grid. To try to get to the bottom of this, we'll compare the radiation from ADS weapons, microwave ovens, WiFi, cell phones and SmartMeters. The difference in wavelength between the telecom's 38 GHz and the military's 95 GHz is not that great since all of this is in the 1-millimeter frequency band. What differentiates a weapon from a cell tower has to do with microwave density or power. 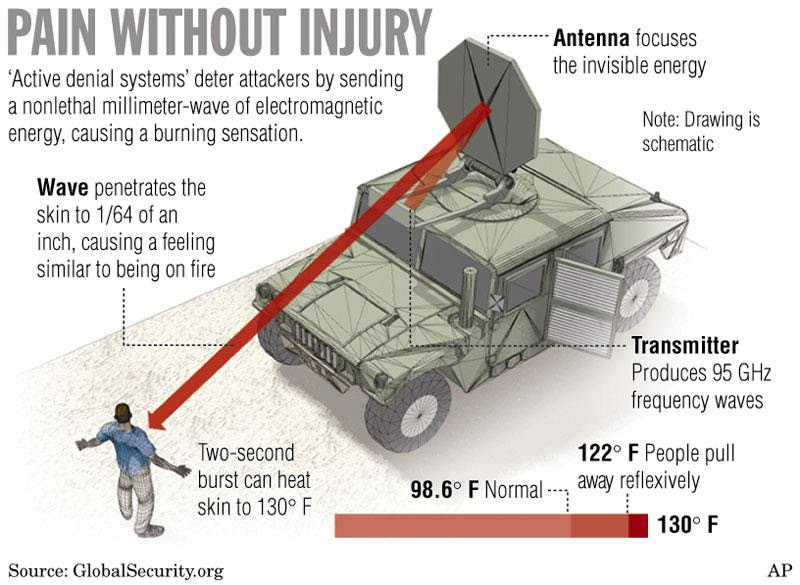 The Active Denial System featured here works by firing a high-powered, focused, free-electron maser beam of 95 GHz waves at a target, which corresponds to a wavelength of 3.2 mm. The beam is produced by a gyrotron, a linear-beam vacuum tube which generates high-frequency electromagnetic radiation by stimulated cyclotron resonance of electrons moving through a strong magnetic field. The action of the ADS millimeter energy beam is comparable to that of a microwave oven, in that it excites the water and fat molecules in the skin, instantly heating them. However, the short millimeter waves used in ADS penetrate only the top layers of skin, with most of the energy being absorbed within 0.4 mm (0.0156 inch), whereas microwaves, which use the much lower frequency (and longer wavelength) of 2.45 GHz can penetrate much deeper into human tissue to about 17 mm (0.67 inch). The longer waves of a microwaves oven can penetrate food (and human bodies) easily – and cook them, if the density is high enough. The microwaves used for WiFi routers are in the same range as microwaves ovens but the density of their transmission is much lower. The health risks associated with WiFi are due to the microwaveradiation being constant, with longer waves that can penetrate into the body and produce cellular changes over time. Cell phones and smart meters operate in the range of 2.8 GHz to 900 MHz, which can penetrate even deeper into the body than WiFi. Because the frequencies used in 5G cannot travel long distances, the network requires more towers closer together. The proposed implementation of 5G in California will require 50,000 new cell towers, 100- to 300 meters apart. The million-dollar question might seem to be: Could 5G cell tower transmissions be adjusted to send much more powerful beams of high density microwaves toward you or a crowd of people, such as is done with the ADS? The immediate answer is no, the standard antennas being used could not produce the microwave density of the military’s ADS weapon without burning themselves up. Still, very little is known about longterm exposure to the existing levels of radiation in the 28 GHz, 38 GHz or the 95 GHz range, especially when pulsed, as with SmartMeters. 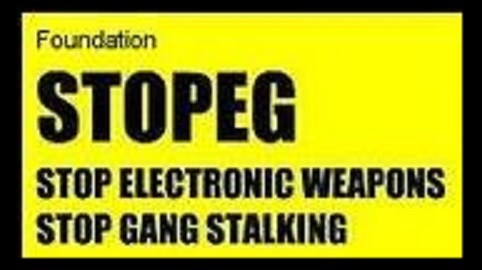 What is known is that microwave radiation from devices in the 900 MHz to 3 GHz frequency range can cause many symptoms of distress and illness in those who are electro-sensitive. The real million-dollar question might then become: Can the existing and proposed wireless networks be used as carrier frequencies to induce brainwave entrainment in conjunction with the silent sound spread spectrum (SSSS)? Another million dollar question might be whether or not the rampant SmartPhone addiction that we see isn’t already a result of such brainwave entrainment? "An unbelievable and highly classified psy-ops program utilizing 'Silent Sound' techniques was successfully deployed. The opportunity to use this method occurred when Saddam Hussein's military command-and-control system was destroyed. The Iraqi troops were then forced to use commercial FM radio stations to carry encoded commands, which were broadcast on the 100 MHz frequency. The US psy-ops team set up its own portable FM transmitter, utilizing the same frequency, in the deserted city of Al Khafji. This US transmitter overpowered the local Iraqi station. Along with patriotic and religious music, psy-ops transmitted 'vague, confusing and contradictory military orders and information. Subliminally, a much more powerful technology was at work, however. A sophisticated electronic system designed to 'speak' directly to the mind of the listener; to alter and entrain his brainwaves, to manipulate his brain's electroencephalographic (EEG) patterns and thus artificially implant negative emotional states — feelings of intense fear, anxiety, despair and hopelessness were created in the Iraqi troops. This incredibly effective subliminal system doesn't just tell a person to feel an emotion, it makes them feel it; it implants that emotion in their minds." Over 200,000 battle-hardened Iraqi Republican Guards surrendered without a single shot being fired. Who's to say that this incredibly effective technology isn't being used elsewhere for different applications? I will continue to study this subject and report back.